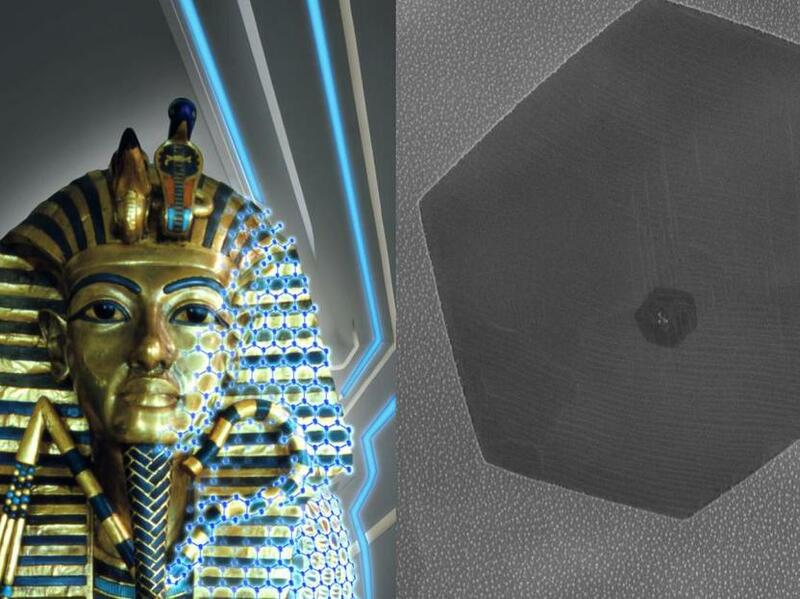 L: An artist rendering of graphene gilding on Tutankhamun's middle coffin (original photograph copyright: Griffith Institute, University of Oxford). R: Microscope image of a graphene crystal is shown on the palladium leaf. Although graphene is only a single atom thick, it can be observed in the scanning electron microscope. Here, a small crystal of graphene is shown to observe its edges. The team produces leaves where the graphene fully cover the metal surface. 14-Sep-2018: Gilding is the process of coating intricate artifacts with precious metals. Ancient Egyptians and Chinese coated their sculptures with thin metal films using gilding--and these golden sculptures have resisted corrosion, wear, and environmental degradation for thousands of years. The middle and outer coffins of Tutankhamun, for instance, are gold leaf gilded, as are many other ancient treasures. 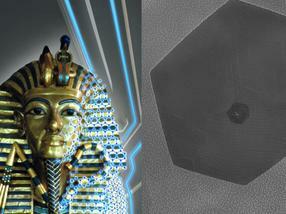 In a new study, Sameh Tawfick, an assistant professor of Mechanical Science and Engineering at the University of Illinois at Urbana-Champaign, inspired by this ancient process, has added a single layer of carbon atoms, known as graphene, on top of metal leaves--doubling the protective quality of gilding against wear and tear. The study, "Gilding with Graphene: Rapid Chemical Vapor Deposition Synthesis of Graphene on Thin Metal Leaves," is published in the journal Advanced Functional Materials. The researchers coated thin metal leaves of palladium with a single layer of graphene. "Adding one more layer of graphene atoms onto the palladium made it twice as resistant to indents than the bare leaves alone," said Tawfick. "It's also very attractive from a cost perspective. The amount of graphene needed to cover the gilded structures of the Carbide & Carbon Building in Chicago, for example, would be the size of the head of a pin." Additionally, the team developed a new technology to grow high-quality graphene directly on the surface of 150 nanometer-thin palladium leaves--in just 30 seconds. Using a process called chemical vapor deposition, in which the metal leaf is processed in a 1,100°C furnace, the bare palladium leaf acts as a catalyst, allowing the gases to react quickly. "Chemical vapor deposition of graphene requires a very high temperature, which could melt the leaves or cause them to bead up by a process called solid state dewetting," said Kaihao Zhang, PhD candidate in MechSE and lead author of the study. "The process we developed deposits the graphene quickly enough to avoid high-temperature degradation, it's scalable, and it produces graphene of very high quality."